The above info came from Fractyl2, and was edited by yours truly (contact me). The image came from G.
Originally, Gatomon was one of Myotismon's head cronies, until Wizardmon helped Gatomon learn of her true destiny as the Digimon partner of the 8th Child, Kari. Her Lightning Claw attack is one of the fastest punch attacks. 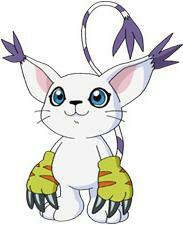 Unlike the others, Gatomon is a Champion, making her in a way the oldest of the Digidestined Digimon. But she would de-digivolve to her rookie form Salamon if she exerted too much energy. She could Digivolve to Angewomon and Magnadramon (Only one time in the movie). During 02, Gatomon lost her PowerRing, which reduced her power. But it turned out to be a mixed blessing, as she was able to Armor-Digivolve to Nerfertimon through the Digimental of Light and DNA digivolve with Aquilamon to form Silphymon.